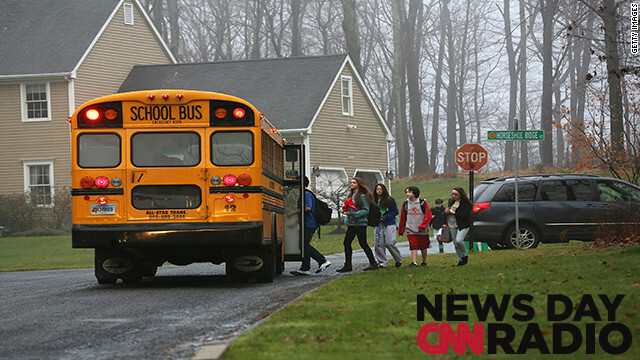 Children in Newtown, Connecticut return to school on December 18, 2012. "I can only sit back for so long and ask the question, 'Why is this happening?' I feel that I need to be part of a movement that can illicit change," said Mary Sireci, a local teacher. "When Columbine happened, I thought it would never happen again because it was so horrific. We've got to be more proactive." "He (Assad) has a certain core of support within the military from his own sect, the Alawites. And as long as they stay loyal to him they command a lot of firepower, a lot of artillery – mortars and the like – and they can fight on for quite a while." "The shootings in Newtown have changed the way things are operating on Capitol Hill. There is a real sense here that politicians on both sides can't be seen as bickering. They no longer can have this partisan fighting going on."